The Tomb of the Twelve has been Found! There is a secret tomb, and behind its seals and wards lay twelve elite warriors, encased in bonds of sacred linen and the purest silver. Though their king is long dead, their service to the powers of darkness is ever a threat. A lone Guardian keeps an eternal watch, forbidding trespassers to enter and the sleeping horrors to rise. 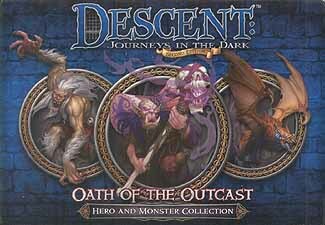 Bring legendary heroes and infamous monsters to your Descent: Journeys in the Dark Second Edition<> game with the Oath of the Outcast hero and monster collection. Explore the unique strengths and abilities of these monsters and heroes by playing the included quests individually or through the use of rumour cards. With 4 heroes, 3 monsters groups, and 2 new quests, the Oath of the Outcasts hero and monster collection gives fresh options to your Descent: Journeys in the Dark game.